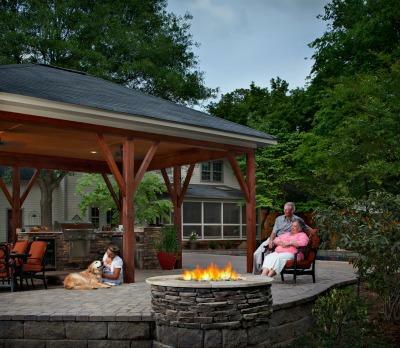 For more than ten years, we have been in the business of helping central South Carolina homeowners design and build the high quality outdoor living spaces of their dreams to provide them with enjoyment for many years to come. Too often we’ve encountered homeowners with horror stories of shady contractors making them subsequently “gun-shy” when attempting to work with another builder. Their experiences have included previous builders that just walked away from an exterior project before it is completed, leaving the homeowners with an unfinished mess on their property, or unqualified builders who provided them with an outdoor living structure far from adequate or acceptable quality. Fortunately, we are here to help. This is how we found the deck when we arrived on the project. We had to pull down what was already done by the prior contractor because it was built so poorly. 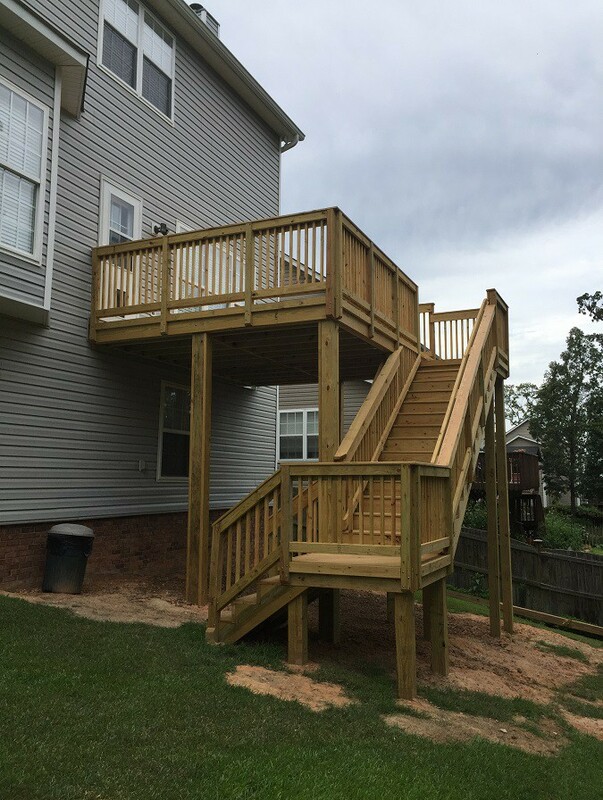 One of our recent projects involved the completion of a deck from which the previous builder walked away before finishing the job. Unfortunately, as we inspected the structure, we discovered quite a bit of re-work that we had to do to repair the other builder’s less than adequate building practices. 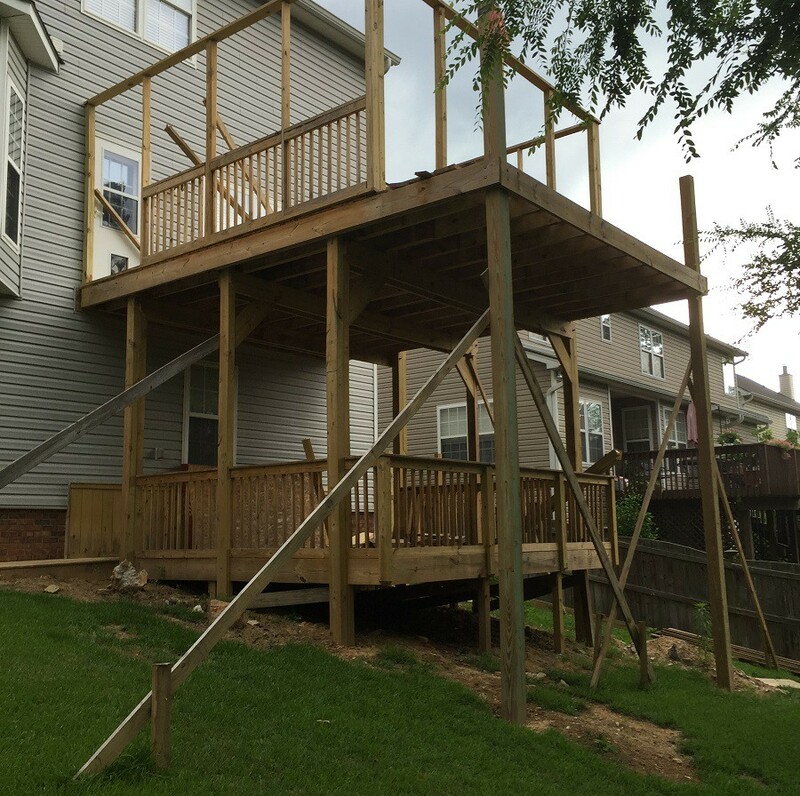 Upon our replacement of much of the framing of the structure, we were then able to finish it out in the proper manner and provided the homeowners with a high-quality, stable deck addition to their home. It’s “clean up” projects like this, along with the string of recent newscasts regarding several deck collapses in NC, that just re-affirm the importance of using a quality builder who does it right the first time. While some of the collapses were due to the advanced age of the decks and some were constructed of low-quality materials, too often they’re due to poor design and building standards of an underqualified builder. You don’t have to settle for poor craftsmanship or an underqualified builder. Allow us to show you that we are a professional contractor that’s knowledgeable, provides high quality work that’s protected by meaningful warranties, follows building codes and requirements, carries the proper insurance and stands behind his work. With just a few short steps, you’ll be able to distinguish between Archadeck, a reputable builder, and those fly-by-night contractors quite easily. 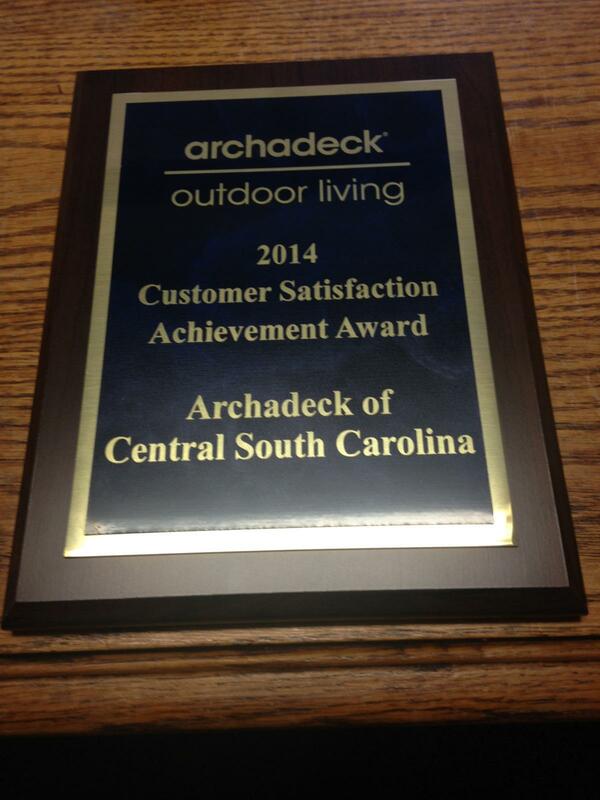 Archadeck of Central SC was awarded the customer satisfaction achievement award this past year. First, verify licenses, insurance and warranties up front. A reputable contractor wants to show you these because he knows they set him apart from the crowd. The second step is tougher – judging the character and reliability of the contractor. You can tell some things by his conduct in the sales process. Was he on time, did he follow up like he said he would and did he explain things well? And the final thing you can and should do is get references from him and call them. You have the right to ask for references, and a professional contractor will happily give them to you because he knows his past customers will be his best sales force. When selecting a professional contractor for your outdoor living project, please keep in mind that this is one area where you truly get what you pay for. If a contractor is properly licensed, carries proper insurance, offers a meaningful warranty, uses reputable subcontractors and gives the kind of reliable and competent service that keeps customers singing his praises, he is not going to be the low-price option. But if you want a high-quality, finished space that will provide you with enjoyment every day and a pain-free construction project, you should be thinking about maximum value, not low price. 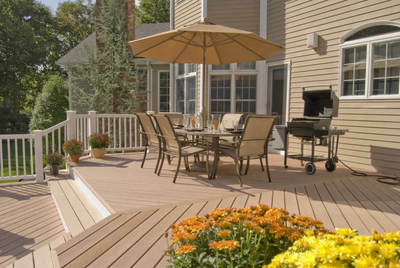 As a Columbia-area homeowner, if you find yourself in an outdoor living conundrum, we can help! Seeing your project become a reality can be enjoyable from beginning to end. With Archadeck designing and building your space, you can be a homeowner who is pleased with the outdoor space you purchased instead of one who is simply glad the project is over. 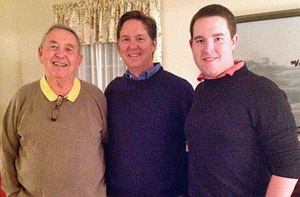 We strive to make every phase of the process an enjoyable one! Making sure we are on the same page as the client during each phase will insure your dream outdoor space is a joy and delight from concept to conclusion. This entry was posted in Contractor Experience, Custom Outdoor Living Designer & Builder, Customized Product, Process, Value and tagged Archadeck of Central SC, Archadeck of Central South Carolina, Central SC outdoor living combination builder, Central SC outdoor structure experts, Columbia SC outdoor structure, Columbia SC outdoor structure design and building, Columbia SC outdoor structure planning, Finding the right outdoor living contractor in Central SC, Finding the right outdoor living contractor in Columbia SC, The importance of experience in choosing the right contractor on July 19, 2015 by archadeckofcentralsc. The third part in our series “The Seven Keys to Finding a Great Contractor” is about the importance of processes. In any business requiring handoffs with multiple people and multiple variables (weather, materials, environment, etc.) it can be difficult to get consistently good results. In fact, many businesses that worked fine when they were very small (one man builders, for example) struggle as they grow to achieve the same consistent, high-quality results. This has been the downfall of many a contractor – and why success can be their own worst enemy. Process plays a key role in the success of your outdoor living project. Processes – or the lack thereof – can be the biggest differentiator between a contractor who delivers good results on time and on budget, and one that is constantly battling chaos at your expense. There are thousands of variables that a contractor faces on every project – it is a rare project that goes without something unexpected happening. However, experienced contractors that have learned from past mistakes will incorporate processes into their workflow to avoid making the same mistake again. For example, taking the time to have utility lines identified and marked before construction begins is often an overlooked step, and 9 out of 10 times, nothing bad will occur. But every once in a while a gas or power line or fiber optic cable is cut, costing the contractor money, interrupting the customer’s service and causing an unforeseen delay in the project. If a contractor has to “remember” to do this every time, it will often get overlooked. However, if his processes require him to check the item off for every job, it should not get overlooked. How do you know if your contractor effectively uses good processes? The easiest way is simply to ask during the vetting process. Find out what your contractor’s method for planning and monitoring construction will be. Do they actually use written check lists for ensuring that all steps get addressed before, during and after construction? Is there a supervisor or manager holding the crews responsible for following these processes? You can also tell a lot about how effectively a contractor uses processes by watching the sales process. Is it well-coordinated, clear and purposeful? Or is it more chaotic? Does the contractor proactively address key concerns in advance, setting your expectations, or does he seem to want to get in and get out without helping you to understand the process you will be going through together in building your project? If the sales process has not been well thought out and executed, you can be pretty sure that the construction process will be the same. Our process begins with a free design consultation. 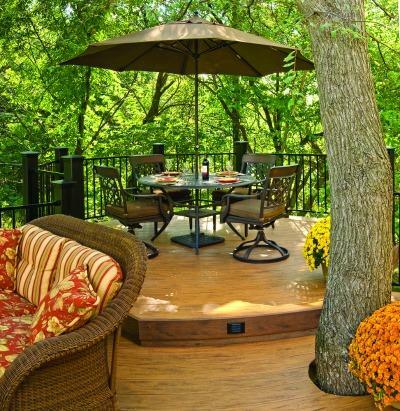 We then conduct a comprehensive needs analysis uncovering what you’re looking for in an outdoor living space. Our in-depth site survey buttons down the particulars. Our detailed photo gallery and portfolio of completed projects will stimulate your imagination. We work with you to refine or streamline your design. Rather than an estimate, you’re given a precise price quote. Our quality-focused Job Process Methodology (JPM) is put into play. 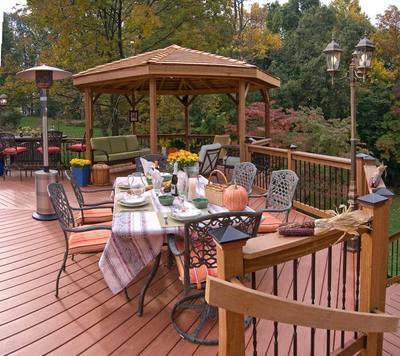 Archadeck of Central SC obtains all necessary permits necessary for your project. Once your project is started, progress almost always proceeds without lags. Our workers respect your property. Construction debris is removed regularly and project site is kept clean and orderly. You approve the final structure and enjoy! The success of a project can be measured by not only the end result, but the way the project itself takes place – beginning to end. After we determine your needs and the specifics of your site, you can choose to move forward in one of two ways. 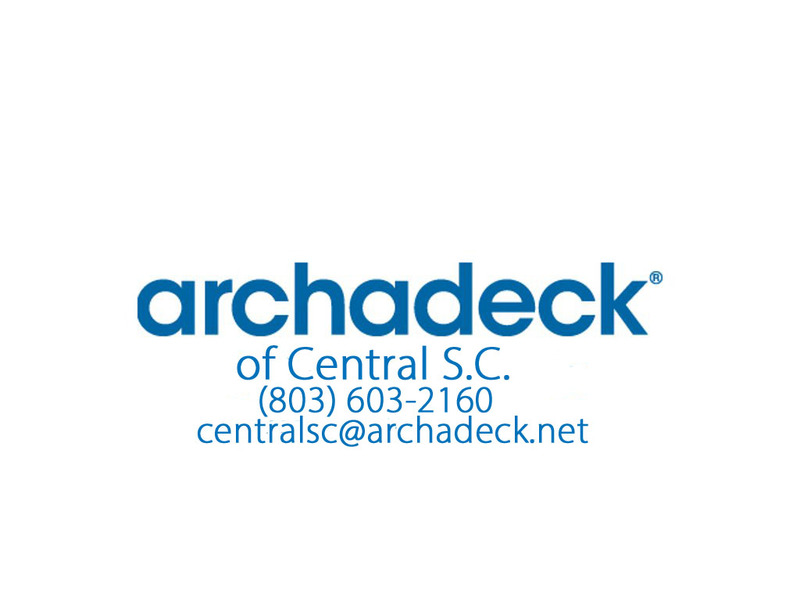 With a project retainer, Archadeck of Central SC will draw up custom plans using three-dimensional drawings to illustrate your proposed structure from a variety of angles. You can work with us to refine that plan to your satisfaction. Or, instead of developing a custom plan, you can choose to move forward in stages as part of our staged, or phased, building program. 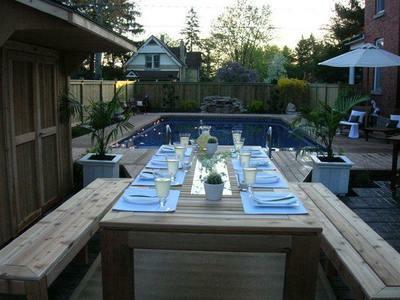 This will allow you to complete your ideal outdoor living space in stages as your lifestyle and budget affords. Our knowledge and experience in outdoor structure design and building over the years can ensure a space that not only meets but exceeds your expectations. 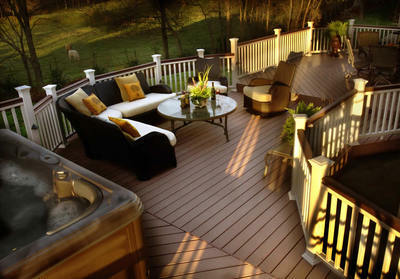 Call Archadeck of Central SC today for a free design consultation (803) 603-2160. Please visit our extensive outdoor structure galleries located on our website for more examples of our lovely designs. This entry was posted in Contractor Experience, Contractor Professionalism, Process, Series on the 7 keys to finding a great contractor, Starting a project and tagged Archadeck of Central SC, Archadeck of Central South Carolina, Central SC outdoor living combination builder, Central SC outdoor structure experts, Columbia SC outdoor structure, Columbia SC outdoor structure design and building, Columbia SC outdoor structure planning, Finding the right outdoor living contractor in Central SC, Finding the right outdoor living contractor in Columbia SC, Seven keys to finding the right contractor in Central SC, Seven keys to finding the right contractor in Columbia SC, The importance of experience in choosing the right contractor on March 9, 2014 by archadeckofcentralsc. As our 2nd installment in the “Seven Keys to Finding a Great Contractor” series, we focus on the importance of professionalism. 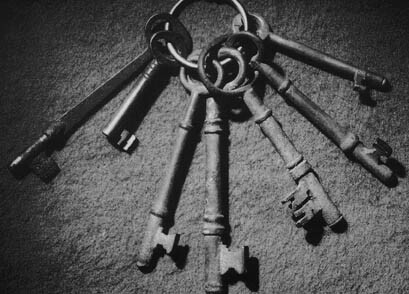 This is the second installment in our series about the Seven Keys to Finding a Great Contractor. This certainly applies to our business of building premium decks, porches and sunrooms, but really these principles apply to almost any area of work in which you might have a contractor perform services for you such as plumbing, electrical or landscaping. Professionalism is an over-used term. Everybody holds themselves out as a “pro.” But under rigorous criteria, most fall by the wayside. In the traditional “professions” (doctors, lawyers, CPAs) there are clear technical and ethical standards defined by oversight groups like the AMA, state bar and AICPA. However, for the more common trades there are usually neither such clearly defined standards, nor strong organizations to enforce these standards. It’s no wonder then that the real world standards of conduct are all over the place for contractors. 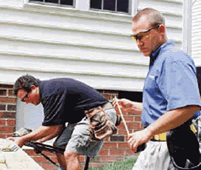 What should you should expect of a professional contractor? Expect your contractor to be properly licensed. A residential contractor’s license in S.C. takes a minimum of two years of working experience plus passing an extensive exam regarding building codes and best practices. Likewise, most trades require licensing to ensure proper knowledge of building codes. Expect your contractor to use such licensed tradesmen. Following through on commitments such as quotes, start dates, completion dates, etc. Following the professional knowledge and expertise in line with the proper professional licensing and qualifications, a professional will ensure that any work that he is responsible for is performed properly in accordance to such standards. A professional will readily stand behind his work with the appropriate warranties and personal assurances that any shortfalls will be made right. Isn’t this what we all want in a contractor – someone who has the necessary knowledge that the layman doesn’t have, performs a high quality of work, follows building codes and requirements, carries the proper insurance, provides meaningful warranties, and stands behind his work? If only this was the norm, not the exception. The last point I will address is: how can you identify such a contractor? The answer is not so difficult. First, check out the qualifications in advance. Licenses, insurance and warranties can all be verified up front. A reputable contractor wants to show you these because he knows they set him apart from the crowd. The second step is tougher – judging the character and reliability of the contractor. You can tell some things by his conduct in the sales process. Was he on time, did he follow up like he said he would? Was he open with communication, explaining things to you and sharing information with you? And the final thing you can and should do is get references from him and call them. Other customers like you will be more than happy to give you the whole scoop – good or bad – about the contractor you are about to hire. You have the right to ask for references, and a professional contractor will happily give them to you because he knows his past customers will be his best sales force. Keep in mind, there are a lot of “fly-by-night” builders that can build your deck. They can offer you a structure really cheap and you may be one of the lucky few who actually benefits from taking this route. These types of contractors rarely have the credentials to cover an accident or other issue that could happen on your property during the building process. This could leave you, the homeowner, holding the bag if the unfortunate happens. Also take into consideration where that “fly-by-night” contractor will be if you have a problem with your structure, months, weeks or even days after leaving. Having the peace of mind in knowing you can contact your contractor for a resolution to a problem, or just to answer a question, is worth its weight in gold! One last word about finding a professional contractor. This is one area where you truly get what you pay for. If a contractor is properly licensed, carries proper insurance, offers a meaningful warranty, uses reputable subcontractors and gives the kind of reliable and competent service that keeps customers singing his praises, he is not going to be the low-price option. But if you care about the finished product that you will live with every day, and about a pain-free construction project, you should be thinking about maximum value, not low price. As we mentioned in our first article in this series, if you want to improve your “luck with contractors,” take luck out of the equation, and hire a true professional. Our knowledge and experience in outdoor structure building and design over the years can ensure a space that not only meets but exceeds your expectations. 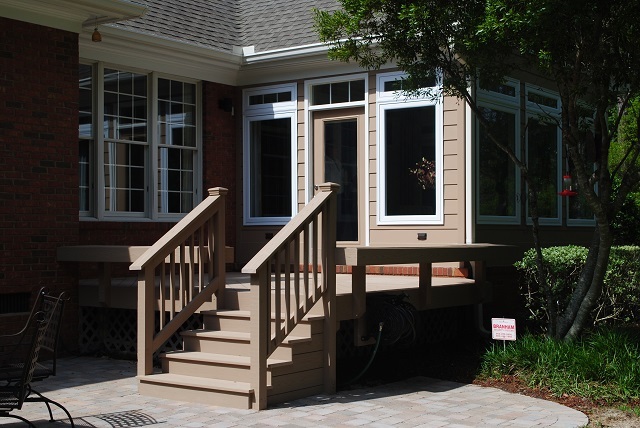 Call Archadeck of Central SC today for a free design consultation (803) 603-2160. This entry was posted in Contractor Experience, Contractor Professionalism, Decks, Outdoor Living, Outdoor living space design and building, Series on the 7 keys to finding a great contractor and tagged Archadeck of Central SC, Archadeck of Central South Carolina, Central SC outdoor living combination builder, Central SC outdoor structure experts, Columbia SC outdoor structure, Columbia SC outdoor structure design and building, Columbia SC outdoor structure planning, Finding the right outdoor living contractor in Central SC, Finding the right outdoor living contractor in Columbia SC, Seven keys to finding the right contractor in Central SC, Seven keys to finding the right contractor in Columbia SC, The importance of experience in choosing the right contractor on February 20, 2014 by archadeckofcentralsc. 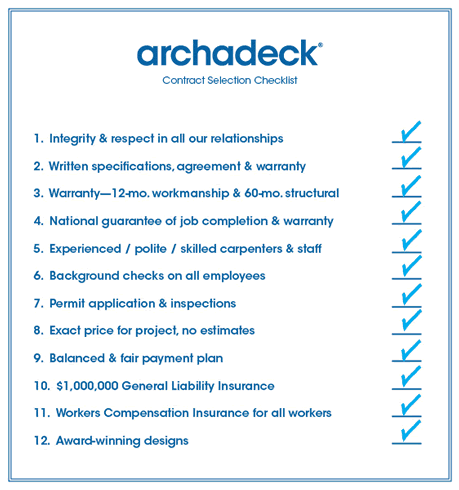 As part one of our series on the seven keys to finding a great contractor, Archadeck of Central SC focuses on what experience means when making this important decision. Just last night on a sales call I heard a common complaint from a customer: “I’ve had some bad luck with contractors.” We hear this a lot when we first meet customers. Prior bad experiences often create mistrust that is based on having been burned. It’s not really bad luck – it’s more about not being thoughtful in selecting a qualified contractor. The problem is there are so many people out there saying they can do your work, but what really separates the good ones from the rest? In this series of articles, we will discuss what each of these means to you and what questions to ask to ensure a good contractor experience. Today we start with the quality of Experience. Experience is the difference between the contractor finding a problem for the first time on your job, and having to figure it out on the fly (usually a bad idea) vs. knowing in advance what problems may arise and proactively avoiding them. It’s the wisdom born from experience that gives a good contractor the courage to say “no, I can’t do that,” rather than blindly creating a mess that he leaves in your lap. All contractors start out wanting to do a great job. The problem is that it’s not that easy. Things quite often don’t go according to plan. When things start to go bad, you really want to have an experienced contractor in your corner. Some questions you should know the answers to before you sign a contractor on are: How many projects like yours has your contractor done? And not just the owner, but what about the organization behind him? What experience do the tradesmen doing the work have? What experience does the person managing and supervising the work have? Is there a support organization behind them providing engineering and technical guidance if they get in over their heads (it’s going to happen sometimes – so who is going to come to the rescue)? These questions go a long way toward determining the outcome of a project, even before it begins. In addition to the technical experience needed to do the job, you should be interested in their customer service experience as well. Too often, contractors try to get in, get out, and move on to the next job – it’s necessary for their bottom line. But the ones who last, the ones who will be doing work in 5, 10 or 15 years, are the ones who know by experience that they can’t leave loose ends hanging on your job. This is the number one complaint against many contractors – they didn’t finish the punch list! Why? – because it’s hard to tie up the loose ends, and it doesn’t pay well (in the short term). But if you are dealing with an experienced contractor, you have a much better chance that he knows that leaving loose ends means leaving an unhappy customer – and leaving an unhappy customer means getting a bad reputation. The good news is that it’s easy to know what kind of contractor you have, simply by asking his customers. A good contractor should be more than willing to give you a list of the last 5 projects he did so you can check behind him. Let our experienced staff help you build the backyard of your dreams. Finally, experience means not only good technical experience and commitment to good customer service, but it also means staying power. You want a contractor who will be around – next week, next month and next year. And the best indicator of this is how long have they been around so far. According to statisticbrain.com, 55% of businesses fail within 5 years, and 71% fail within 10 years. Not only is longevity a good indicator that the contractor has been doing the right things for customers that have kept him in business, but it also means that the chances of him being around if you have a problem a year or two later are much higher than if he is new to the business. So when selecting a contractor, ask the hard questions about experience. It’s something that fast-talking fly-by-night contractors cannot answer well. It’s something that a flashy new business plan cannot provide. It’s the difference between “I know I can do your project because I’ve been doing it for 10 years” and “trust me.” Which one do you want to rely on? This entry was posted in Contractor Experience, Series on the 7 keys to finding a great contractor and tagged Archadeck of Central SC, Archadeck of Central South Carolina, Central SC outdoor living combination builder, Central SC outdoor structure experts, Columbia SC outdoor structure, Columbia SC outdoor structure design and building, Columbia SC outdoor structure planning, Finding the right outdoor living contractor in Central SC, Finding the right outdoor living contractor in Columbia SC, Seven keys to finding the right contractor in Central SC, Seven keys to finding the right contractor in Columbia SC, The importance of experience in choosing the right contractor on February 14, 2014 by archadeckofcentralsc.